As of January first the new pet rescue adoption act states that pet stores in California are required to only sell dogs, cats and rabbits that come from shelters or nonprofits. 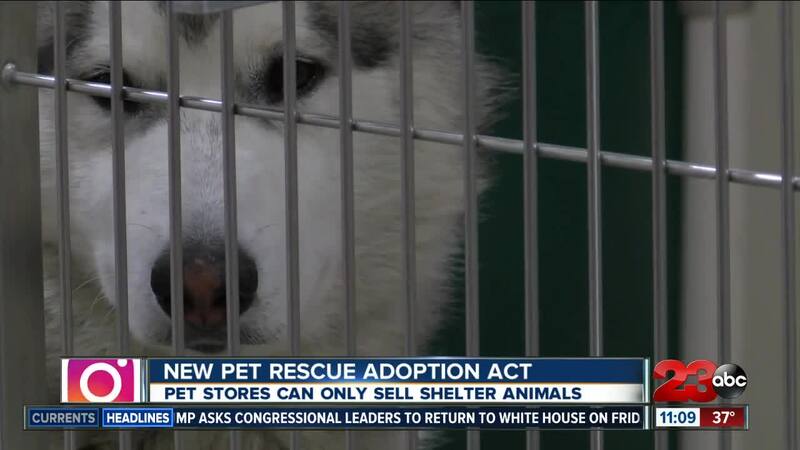 BAKERSFIELD, Calif. — As of January first the new pet rescue adoption act states that pet stores in California are required to only sell dogs, cats and rabbits that come from shelters or nonprofits. "There are so many animals in kern county that we can't get them adopted fast enough so that's why we try to rescue as many as we can and partner with other rescues up north,” said Sheila Powelson. For years, the kern county animal services and a safer place animal rescue, amongst many rescue centers in Kern County, have partnered up with stores and shelters to find homes for animals in need. "It highlights the fact that sheltered animals are no different than any other any animal you might get otherwise," said Nick Cullen. However not every store chooses to adopt out rescues, instead selling pets from breeders. But as of January first the new pet rescue adoption act took effect across the state. The new law states that animals must be obtained from an animal shelter and the store must provide the name of the agency where it got the animal and no breeders will be allowed. Although shelters in kern county already partner up with stores, Sheila says this new law will still help reduce the amount of animals in need thanks to their partnership with recuse centers in bigger cities, causing a domino affect. “We are going to be able to get more dogs out and since we are over populated with animals in kern county we do ship them off to other rescues and shelters so with this law being put in place its going to higher their adoption rate and lower the euthanization rate in their shelters and I think we will be able to get more dogs out of kern county,” said Sheila Powelson. Also reducing the demand for animals breeded for sale.